Innovative technology which allows National Grid to control wind turbines remotely is being developed at a North-East business thanks to a partnership with Teesside University. From left - Dr Michael Short, Jordan Robinson and Paul Usher, Business Development Director at Quorum. Quorum Development, of Sedgefield, County Durham, is a market leader in providing EDT (electronic data transfer) and EDL (electronic dispatches and logging) interfaces to National Grid. Jordan Robinson, an MEng Instrumentation and Control graduate, during a four month work placement and as part of his Master’s degree project at Quorum Development Ltd, developed an interface that connected up Quorum’s software to a wind turbine, demonstrating that National Grid could automatically control a wind turbine’s output. The company recently showcased a working prototype of this system using the software built by Jordan, which attracted considerable interest at a major industry conference for the energy sector. Quorum is now investigating possible industry partnerships to utilise this technology and is looking into the possibility of a further partnership with Jordan and Teesside University. Jordan, who is from Middlesbrough, began working on software projects at Quorum as part of his undergraduate degree and then undertook the placement as part of his Master’s course. The remote control system he has designed will make it much simpler for National Grid to automatically control wind turbines, many of which are in remote or hard-to-reach places, in order to meet the balancing demands of the National Grid. Jordan said: 'The model I have developed proves the principle of the software and demonstrate that it works in practice. The placement has been a real success and the model that Jordan has developed has given us the confidence to go forward and start developing this software further. Paul Fothergill, the Technical Director of Quorum, said: 'The placement has been a real success and the model that Jordan has developed has given us the confidence to go forward and start developing this software further. The MEng Instrumentation and Control Engineering helps students develop their knowledge and skills in instrumentation, electronics and advanced control engineering, and helps them develop the ability to analyse information from a variety of sources in order to make effective decisions on complex instrumentation and control engineering problems. Throughout the placement, Jordan was supervised by Dr Michael Short, a Reader in Control and Instrumentation in the School of Science, Engineering & Design. Dr Short said: 'We are delighted that this placement was so beneficial to Quorum. 'It initially developed from some consultancy work that I did with the company and it’s been fantastic to help them with a placement and hopefully further partnership. 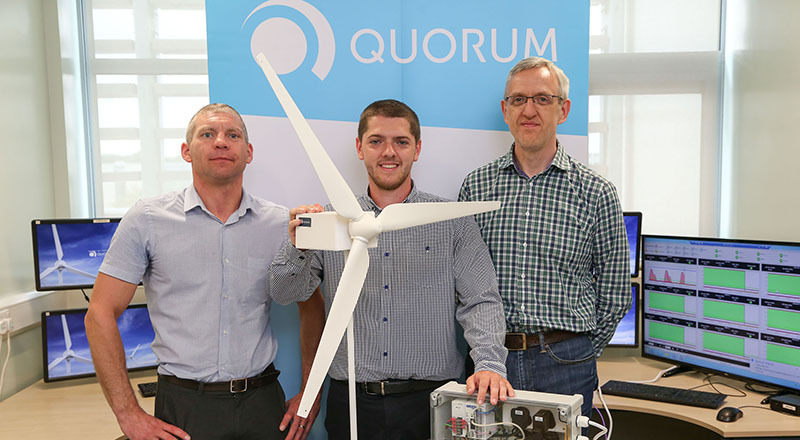 Teesside University student placement helps Quorum Development energy software company develop prototype.